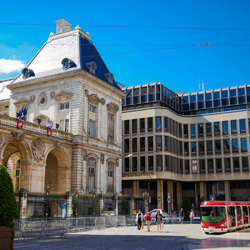 If you really want to know the city streets, this is a way to have an in deep introduction to Lyon street life and points of interest. The tram station are very well located in the city and maps and schedules are available everywhere. The service is puntual and clean. 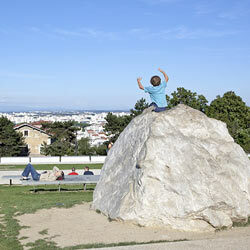 This small tourist train toils up the slopes of the historic Croix-Rousse district with its unusual charm. Lyon City Tram shows you the hill of the canuts from an unusual perspective. 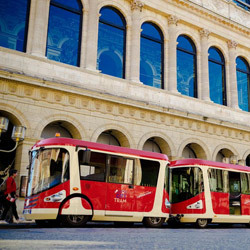 And the vehicle's design was not chosen at random either: it resembles Croix-Rousse's former cable car nicknamed Ficelle by the locals. 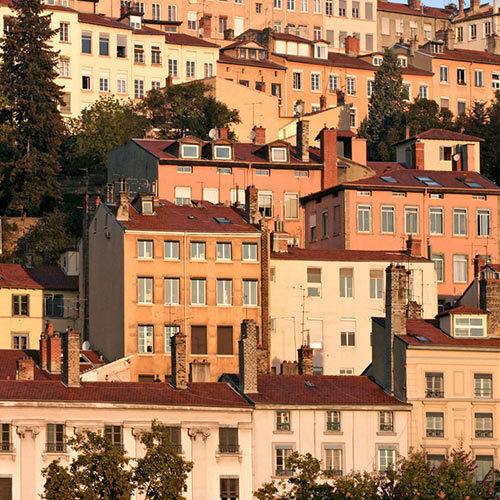 After departing from the heart of the city centre, this little train with its panoramic roofs scales the hills of the Croix-Rousse district to reveal its unusual architecture, with the amphitheatre of the three Gauls and several painted walls on the way: the "Fresque Végétale Lumière", the "Mur des Canuts", a painted wall devoted to Lyon's silk workers, and the trompe-l'oeil painting of Lyon's most famous inhabitants. The sheer size of the Jacquard looms meant Croix-Rousse hill buildings had to be designed with ceilings over 4m high and large windows for better lighting. The ‘traboules’ covered passageways protected the silk from the rain during transport.